The Model 7025 combines the functionality of two high pressure high temperature (HPHT) consistometers into a single, smaller system. This saves valuable lab space. The Model 7025 design is one of Chandler Engineering’s most proven consistometers. Hundreds of units are in operation globally. Experience with these rugged instruments has demonstrated that their service lifespan is one of the longest of any consistometer with normal, routine maintenance. Every unit is tested extensively at the factory with standard cement to ensure that the instrument meets API / ISO requirements. achieved quickly. The slurry cup drive automatically rotates the cup at the required, standard rate of 150 rpm. Indicators for test time, consistency, pressure and temperature are readily visible on the front panel of the unit. A chart recorder automatically tracks the temperature and viscosity measurements during a test. 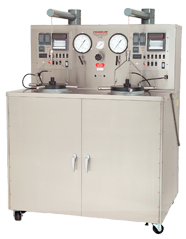 The usefulness of the Model 7025 Consistometer is not limited to the standard testing of cement thickening time. It can also be used to prepare slurries for other tests such as measuring free water content, testing for fluid loss or rheological properties and viscosity. For enhanced research and testing capabilities, the 7025 can be equipped with an external chiller for performing tests at deep-water temperatures.